Okay. You have decided to keep the house clean. Let me assume you are ready to buy a suitable vacuum cleaner for the purpose. And you are confused. Should I buy a bagless or bagged vacuum? What are the advantages and disadvantages of bagless over bagged? 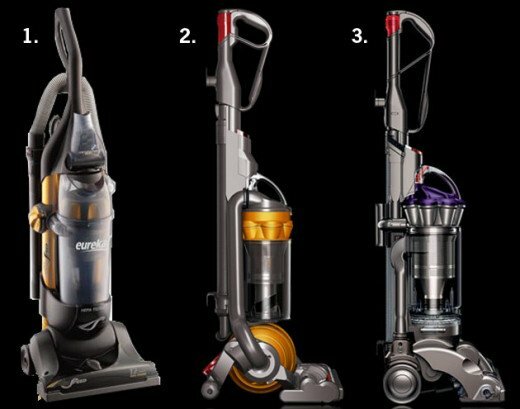 What is the best bagless vacuum cleaner? The bagged vacuum cleaners were very popular a while back but now the market is captured by bagless vacuum cleaners with motorized brushes. The reason for this is listed as the advantages of bagless vacuum below. Low running cost: For a bagged vacuum cleaner, you need to replace the bag more often. Most of them come with a disposable bag. You don't need to worry about this in a bagless version. You can just remove the dirt tank, dump the dirt, clean it and attach it back. Easy! 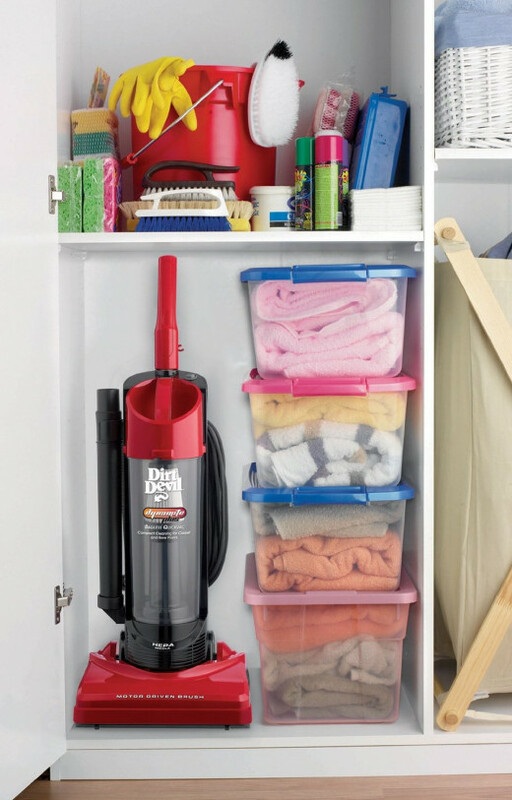 Dirt containers in bagless vacuums are transparent so that you can understand when to empty them. Reduction in suction power: For both bagless and bagged type, the suction power get reduced as the dirt accumulates. But for the bagless type, the reduction is less than bagged. 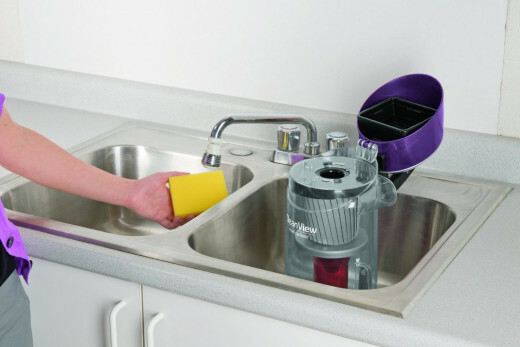 Also in some advanced model like Dyson DC35 Animal Complete, the suction power remains the same. 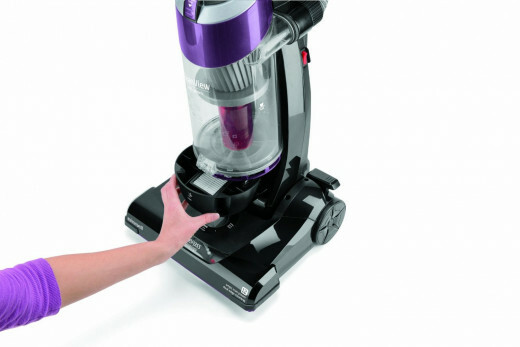 Ease of use: The bagless vacuum is always ready to work. For a bagged vacuum, if the bag is full, we cannot do the cleaning until after we purchase a new bag which we forget often and this become very frustrating. Believe me it happens! Well, there are some disadvantages also for bagless vacuums. First if your vacuum has replaceable filters, you need to replace it every 6 months. The solution is to look for washable filters. You don't need to replace them. Another disadvantage is that it is really messy when you dump the dirt, you may have to hold the breath while doing it. Or you can dump it in a disposable bag, tight it and throw away. If you have allergies or asthma, buy one with HEPA filtration system. 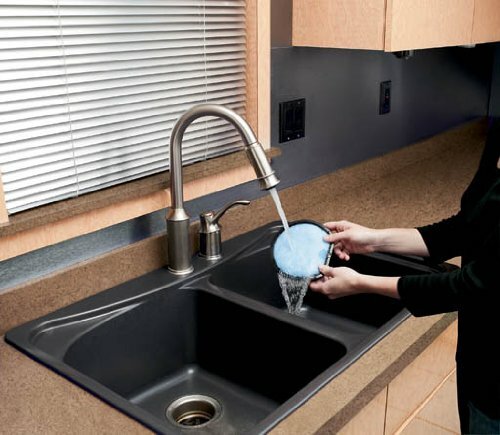 This filter is a post-motor filter which helps to prevent the allergens from coming back after suction. I think, now you have an idea about bagless and bagged vacuums. To make the search for the 'better vacuum' easier, here is the list of best bagless vacuum cleaners with pictures, specs and buying options up to 50% discount. 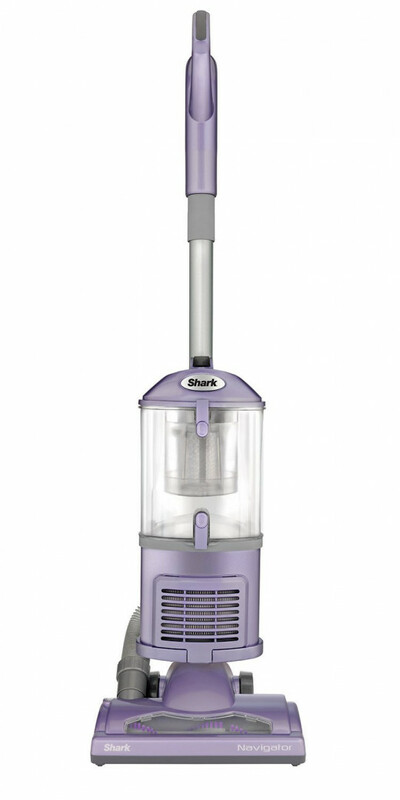 Shark NV352 is a compact vacuum cleaner with removable handle. It is highly portable. The top part can be detached from the floor brush. The removable handle acts as an extension wand too. It is very light weight weighing less than 14 pounds. Therefore, Shark NV352 is a portable, compact and light weight vacuum cleaner. Despite being compact and all, users have complained about the clumsiness and poor build quality of the parts. It features a 24 foot power cord which is standard for the price. The dirt holder can be detached and cleaned but not as easily as the others in the list. Shark NV352 features 3 filters, two pre-motor and 1 exhaust filter. Exhaust filter prevents allergens to get back to the space. It also features motorized brush roll and cyclonic suction for cleaning the floor, yet its performance is not good as Bissell or Hoover. It also has a weak suction than the others. The extra tools that come along with the products are useful and good. The 80 inch removable hose is one of them. The tools can be used to clean upholsteries, crevices, stairs and pet hairs. Other than the compactness, lightweight and the useful extension wand/handle, Shark NV352 does not deliver much. It offers 2 years warranty. Buy this only for the above mentioned features otherwise consider Bissell or Hoover which is far less priced. 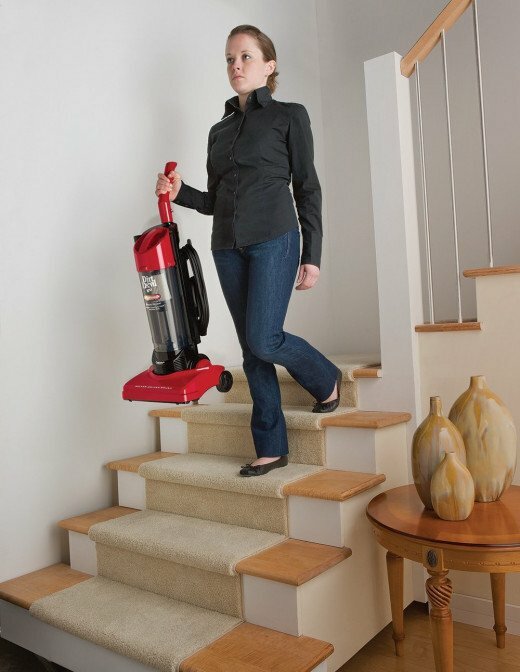 Hoover WindTunnel was introduced to the market as a vacuum that prevents the dust and allergens from coming back out. If you are living in a dusty environment, consider this vacuum cleaner. It comes with a HEPA filter that blocks allergens from coming back out. There were several features and extra hand tools with this vacuum that got our attention. First being the 27 foot power cord which is capable of rewinding which in turn saves you from the tedious job of wrapping the cords. There are tools that help you to clean the whole house and not just the floors. They are crevice tool, upholstery/brush tool, air powered hand tool and extension wand. Using these you can clean that ‘hard to reach’ parts of your house as well as stairs, upholsteries and crevices. It also features a 5 position adjustment so you can adjust the height of operation and it helps to clean bare floors to thick carpet with minimum or no stress. The WindTunnel UH70120 uses the dual cyclonic windtunnel technology that prevents clogging in the dirt tank. 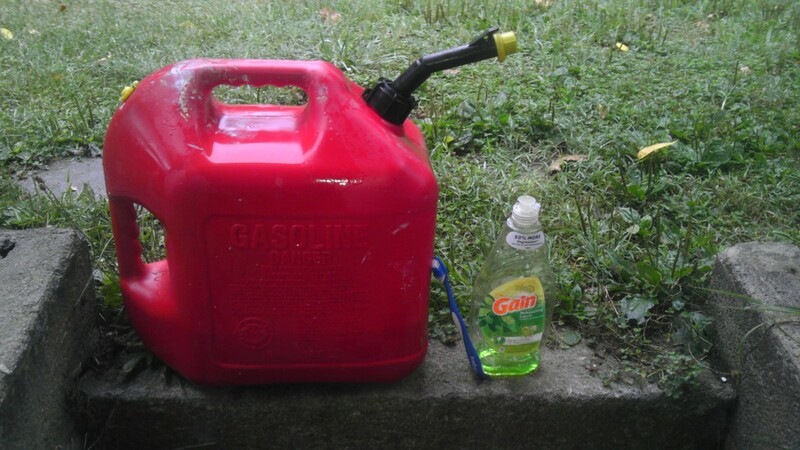 Emptying and cleaning the tank is very easy. It features 2 filters, one washable filter and HEPA filter that blocks the allergens. It also has the Embedded Dirt Finder which relies on sonic technology to let you know the concentration of dirt in the carpet. Similar to Bissell CleanView OnePass 9595, this machine also fails to pick up large debris lying on the floor because of the ‘unstoppable’ motorized brushes. Also, the brushes do not extent to the very edges and as a result, the edges and corners do not get cleaned. But you can always use the powered hand tools to do this job. 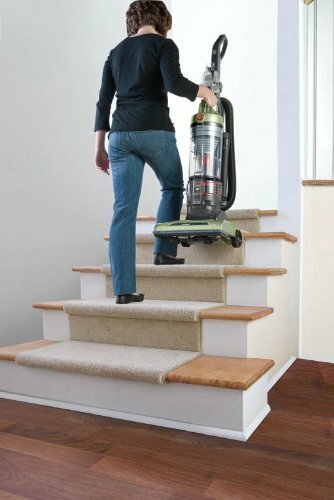 The main benefits of Hoover WindTunnel T-Series Rewind UH70120 compared to Bissell CleanView OnePass 9595 are the HEPA filter, adjustable height and the 27 foot retraceable power cord. Hoover offers 2 years warranty. The machine is light weight also weighing only 16 pounds. Dirt Devil Dynamite Bagless Upright Vacuum Cleaner delivers high performance and there are lots of features for the price. It works well on both carpets and bare floors. The Dynapower technology ensures that the vacuum cleaner picks up every bit of debris no matter how heavy or big it is. All the parts are of high quality and from the look itself, you can say that this is going to last for years. This is the lightest vacuum cleaner in the list. It weighs only 8 pounds and it is so compact.I was surprised to see how a small machine delivers such power. Dynamite also has HEPA filter to keep the allergens inside the vault. The tank is large and it is easy to dismantle and clean it. 25 feet long cord is another charm. You can clean the largest room without stopping. An inbuilt stretchable vacuum hose can be used to clean the hard to reach areas and besides that there is an extension wand, crevice tool and a dusting brush. One of the reasons for the compactness of Dirt Devil Dynamite is the ClickLock metal handle. The handle slides down when released which helps you to store the cleaner anywhere you want. It comes with a 1 year warranty for parts and labor which is appealing for the price. Overall, this is a perfect choice for daily cleaning and is very inexpensive. Bissell packs high performance and excellent features in a budget vacuum cleaner for just below $80. The main attraction of Bissell OnePass 9595 is the redesigned bruhroll. As the name indicates, it can pick up more dirt in a single pass which will eventually saves your time cleaning. 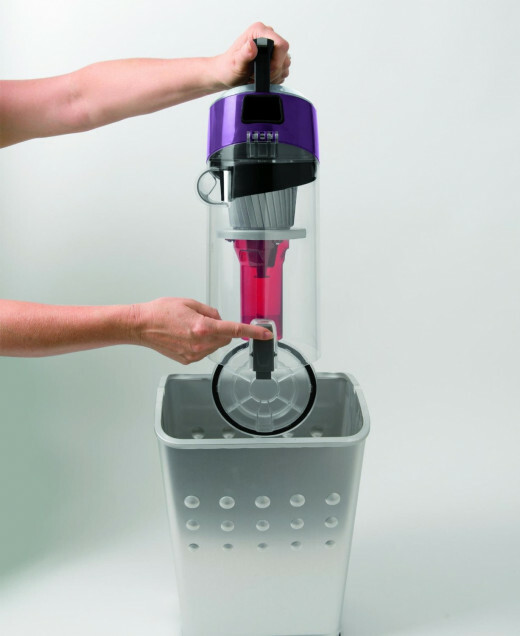 Since it is a bagless vacuum, the cyclonic system maintains suction power even as dirt bin is filling up. You get uniform cleaning throughout the house. The dirt bin capacity is 2.2 liters which is more than enough for a normal house. 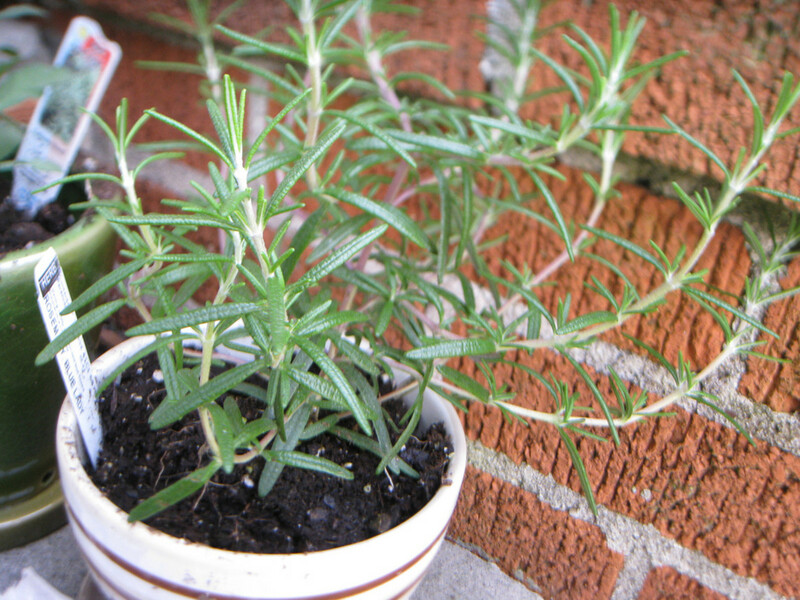 It is easy to detach and empty the dirt bin. It also comes with a handful of tools to clean upholstery, stairs, crevices etc. These tools (Turbobrush tool, Crevice tool, Brush tool, Extension wand) can be attached to the 8 foot long flexible hose to do the job easier. 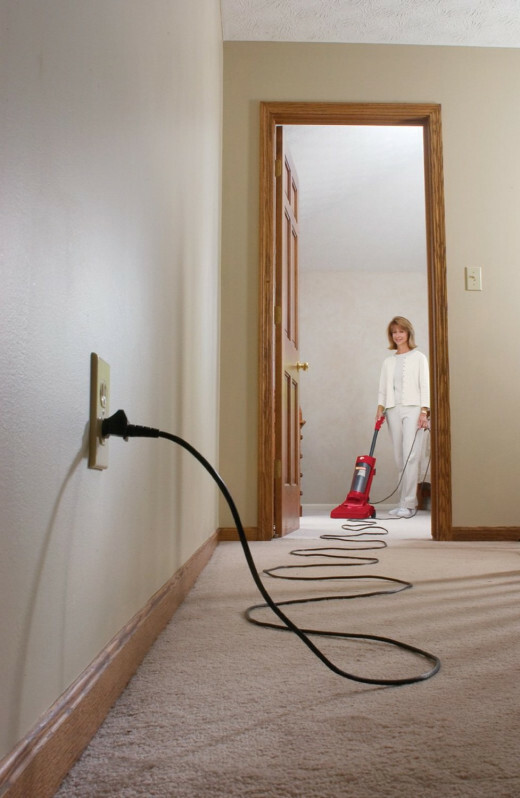 The vacuum cleaner has 25 foot long cord which is very convenient to use. 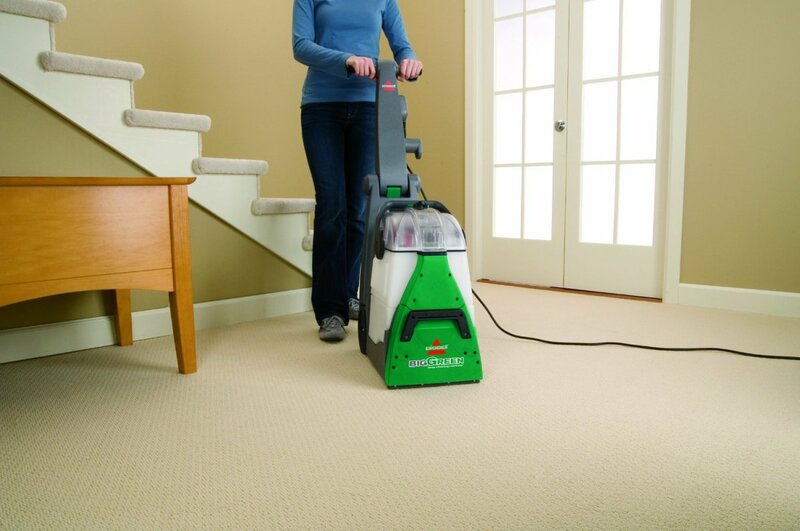 Bissell CleanView OnePass 9595 is perfect for carpets but it is not effective for larger debris in bare floors. It will pick up small particles and dirt just fine but there can be an issue with larger debris as the brush roll tends to fling them instead of picking up. It is extremely useful for cleaning pet hairs also. The filter can be removed and washed. Emptying and cleaning the dirt tank is also just as easy. The vacuum is lightweight (15 pounds) and easy to carry around. The only drawback is the non-stoppable motorized brush rolls which do not pick up large debris from hard floor. If you are planning to use it on a low pile carpet, it is a perfect choice. Bissell offers 2 year warranty for the equipment. 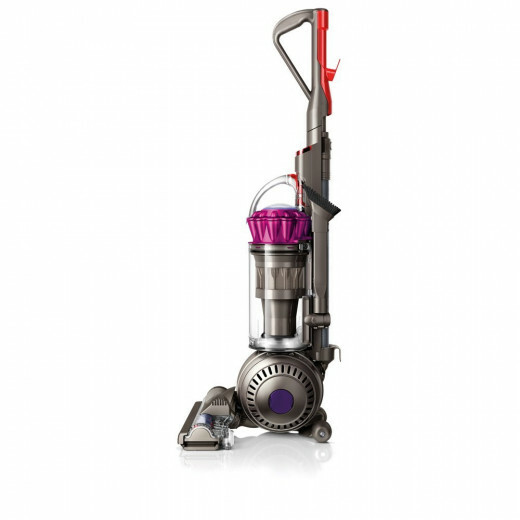 Dyson DC65 is a fairly new model introduced last year with lot of changes from its predecessor. The main change they made is to update the suction method, Radial Root Cyclone technology to increase the suction power by 25%. 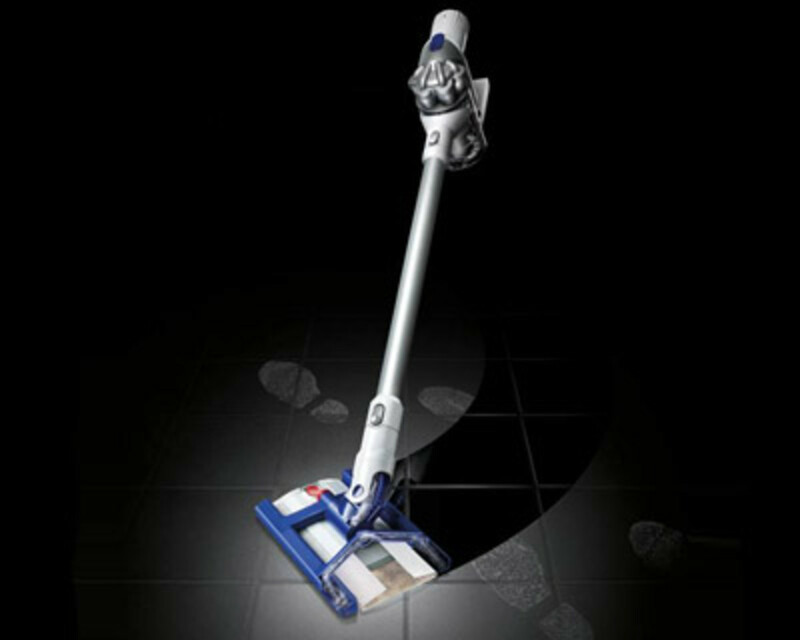 Dyson DC65 also features motorized brush bar for cleaning the carpets. It easily removes any pet hairs and other debris. 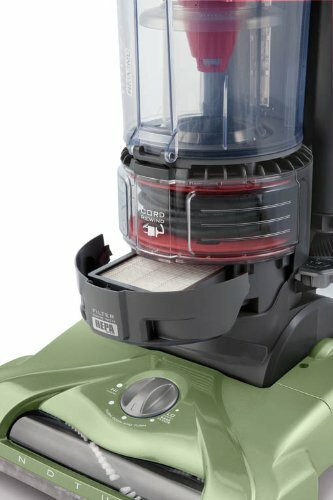 The major drawback to the Bissell CleanView OnePass and Hoover WindTunnel T-series was the ‘unstoppable’ motor which causes large debris to fling around instead of sucking it up. Dyson’s brush bar can be turned off which means you can use the vacuum cleaner equally for delicate rugs, hard floors and thick carpets making it a versatile vacuum cleaner. The features Dyson put into this cleaner are amazing. The latest Dyson Ball Technology is one of them. The vacuum cleaner rests on a ball for easy twisting and turning around. You will find it very useful in practice. Another notable feature is the self-adjusting cleaner head which gives you more suction power and cleans more efficiently. The bundled tools are also a charm. Main attraction among these is the air-driven tangle-free mini turbine tool to clean upholstery, stairs, and cars for dirt and pet hair. Tangle-free means it can remove pet hair without tangling. The extra tools include a Stiff Bristle Brush, Soft Dusting Brush, Multi-Angle brush, Zorb powder, a combination accessory tool and a stair tool. Meanwhile HEPA filtration makes sure the vacuum cleaner is hygienic and non-polluting. It has a 35 foot power cord which is the longest in the list, 5 year warranty which is also the longest and the rugged filters that last for a lifetime. The filters will not clog easily and you will not have to clean it often. Dyson DC65 Animal Complete is Dyson’s best upright vacuum and pet hair vacuum. We are impressed by the performance; all the features and positive user reviews make it our top pick of best bagless vacuum cleaners. A review: "I've owned a lot of vacuums. A LOT. And until a couple of years ago, there was no contest: My Dyson DC25 Animal was by far the best vacuum I'd ever owned. "